Veerabhadra temple (Telugu: శ్రీ వీరభద్రస్వామి దేవస్థానము) in Lepakshi Andhra Pradesh is a beautiful temple dedicated to Lord Siva. Built in the 16th century on a hillock, the temple is famous for its wonderful exquisite sculptures and mural paintings done in the Vijayanagara style. 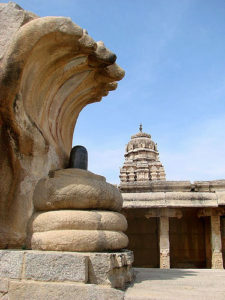 Skanda Purana refers to Lepakshi as one of the 108 important Shaiva Kshetras. Lepakshi, Anantapur district, Andhra Pradesh. 120 km from Bengaluru.